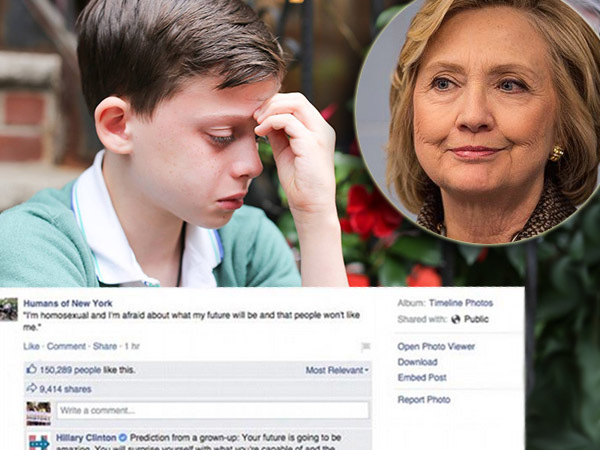 Hillary Clinton offered moral support and encouragement to a young boy concerned for his future as a homosexual man. Her words soon went viral and surely left the sad youngster feeling heartened. As part of the Humans of New York photo blog, a blog which highlights the plight of everyday New Yorkers, a picture showing a teary-eyed young boy was shared on Facebook. The picture was posted to the hugely popular Humans of New York Facebook page, which boasts 13 million followers, where it received thousands of comments and likes. In and amongst the thousands of comments was some encouraging words from US presidential candidate, Hillary Clinton. The former US secretary of state signed her post "H" hinting that it had been written by her personally and not just on behalf of her campaign. Within 24 hours of Hillary’s comforting words being posted the picture had been liked by more than 530 000 people and shared over 47 000 times - to date the post has more than 615 000 likes and over 58 000 shares. Hillary has made her support for marriage equality one of the cornerstones of her 2016 presidential campaign.